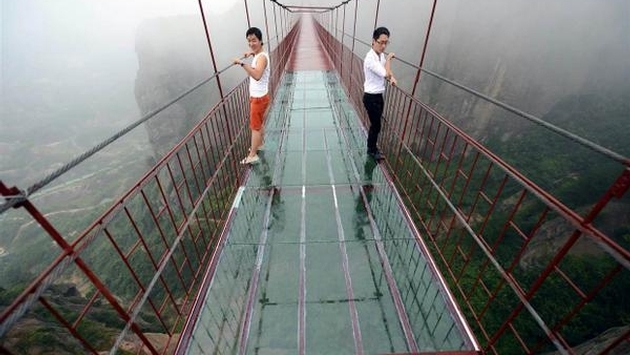 Thrill seekers and bridge lovers alike have a go-to destination in the form of China’s transparent bridge that sits 180 meters above the Pingjiang ground. NBC News’ David Arnott reports on the amazing structure that allows visitors to look down below their feet to see something quite terrifying. Metro caught up with some people who crossed the bridge that spans a 1,000-foot expanse in southern China’s Hunan province. I had a similar experience, walking out onto the observation deck at Willis Tower in Chicago. While a fear of heights made it memorable, I have to concede this bridge is far gnarlier. It’s not like the observation deck was blowing in the wind. Add a transparent bottom that shows the massive drop to the floor below and you have a tourist spot I am perfectly fine enjoying in the form of pictures.